Separation is key when putting out household wastes. Every kitchen should have a number of separate containers for the different types of waste (See photo). What material goes into which container depends largely on the council’s waste collection system. In Aberdeen City, which has recently changed to a co-mingled system for dry recyclables, we now only need one container for dry recyclables and one for residual waste. 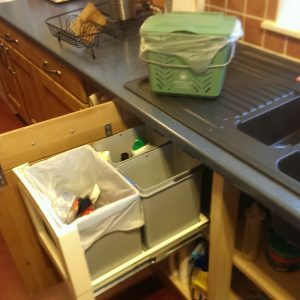 By putting putrescible organic waste into a kitchen caddy (See top of photo), destined for composting, the potentially smelly, less pleasant part of household waste is kept separate from the remaining waste, helping to keep material for recycling clean. Increasingly, councils are collecting compostable waste in small bins or together with garden waste. The waste is shipped to a large composting plant, or anaerobic digester, to be treated and converted to compost for putting on to agricultural land as a valuable fertiliser. It may sometimes be available for sale to householders for their gardens. Should no compost colllection be available, you can compost the majority of your organic waste yourself in a home composter. 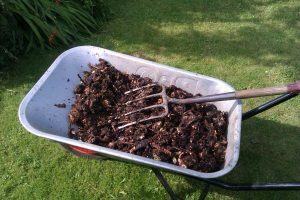 The food waste, when added to garden waste, enhances the fertiliser value of the garden compost, reducing the need for inorganic fertiliser to be applied to home grown vegetables. If the compost bin is an open construction, accessible to rodents, only vegetable matter, paper and cardboard should be composted. 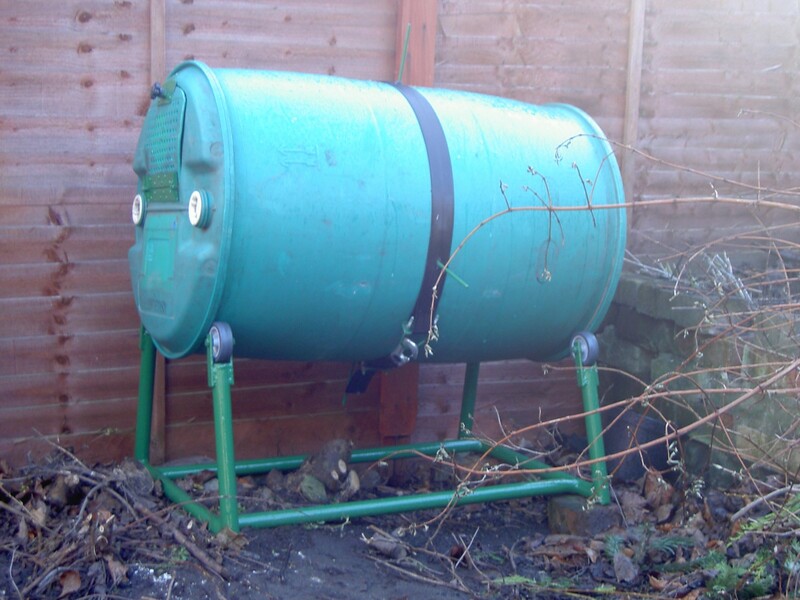 I use a homemade rotary composter (See photo). Not only does it allow regular mixing of the compost, but it prevents rats accessing the contents. This allows meat scrapings, chicken or turkey bones to be added. Since the waste is 10-15 % dry matter, its initial volume reduces greatly. The composting process in a large scale commercial composter is quite different from a home composter. In the former, temperatures rise to 70°C, and the material converts to a crumbly compost material within 5-7 days, with any weed seeds killed by the high temperature. The compost is then allowed to stabilise (become inactive), in large windrows over a six month period. In the home composter, the food waste rots at a slow rate, taking six months to become a crumbly brown compost. Even then egg shells, bones, and orange peel may still be present. When mixed with garden waste, it may take a further year to become suitable for applying to the vegetable patch. Any weed seeds present will still be viable. Items which are commonly recyclable are paper, cardboard, glass bottles, aluminium/steel cans and plastic bottles. Increasingly councils are accepting yoghurt cartons and meat trays. There may be occasional collections for batteries and electronic equipment, or councils may allow these items to be included in a collection box for other material. Whatever your view of what should be recycled, it is essential that you only put in the recycling container what the council asks. If you add other materials, they have to waste time and pay labour to pick these out for disposal to landfill. Separation for recycling is best done at source, in the home. However, every separated group of recyclables requires a separate container. Councils have to decide on how many containers to provide and whether to use refuse collection vehicles (RCVs) with multiple compartments (kerbside sort) or just one or two (co-mingled collections). The Scottish government and EU commissioners prefer the kerbside sort, but a number of Scottish councils (e.g. Aberdeenshire council and Aberdeen Council) are defying their recommendations by selecting co-mingled collections, as these were thought to be cheaper. A recent study (WRAP, 2016) suggests otherwise. The second problem with co-mingled recyclables, is whether they are of good enough quality to find a buyer? Now that Aberdeen city has a co-mingled collection system and a modern MRF, we will be able to see if the quality is as good as previously. More information on household waste and recycling policy is available under 1 Planet living. The householder’s best approach to packaging is to avoid buying packaged products or choose materials with only minimal packaging. Choosing not to drink carbonated drinks or beer not only helps maintain your waistline, but saves throwing away large numbers of cans and bottles. Cordials, tap water, milk, natural fruit juices are better for you and can also reduce what is recycled. Buying bottles of water is unnecessary. Milk is still available in returnable glass bottles, delivered by a milkman. Larger fruit juice cartons use less material than individual cartons. Reusable thermos mugs are available to save getting disposable cups at coffee or tea venders. Paper makes excellent packaging, as it can be recycled with paper if clean, or composted, if dirty. PET (e.g. carbonated drinks) bottles, natural white HDPE (e.g. 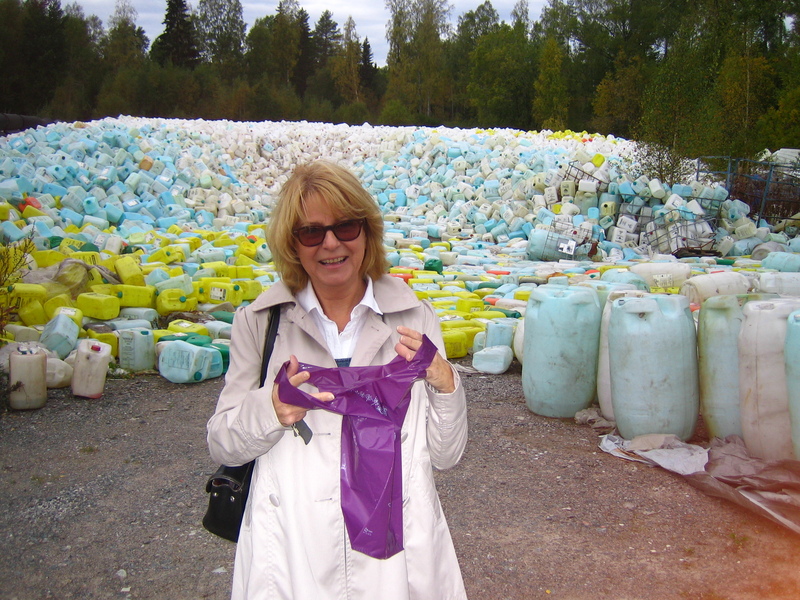 milk) bottles, and coloured HDPE (e.g. shampoo) bottles are all worth recycling. Flimsy films and polythene bags are not. Try to avoid plastic/foil sachets with straws, plastic PET bottles with colourful PVC outer film (e.g. Lucozade), or highly coloured plastic bottles. Bottles made of mixed plastics are more difficult to separate, while highly coloured plastics need high quantities of dyes added (See photo) to the newly formed plastic to overwhelm the original colours. Yogurt tubs and meat trays are increasingly able to be recycled. Put household plastic bags or film, polystyrene beads for protecting parcel contents, clear polystyrene boxes for fruit, grapes, biscuits, in the residual waste as they are only suitable for landfill or burning. Never put electrical or electronic gadgets in the residual waste; nor batteries of any sort. These contain materials that we need for future generations and which can be retrieved in specialist dismantling facilities. When buying replacement electrical equipment, retailers are required by government either to take back the equipment being replaced or pay an annual fee to a Designated Collection Facility (DCF). These DCFs will then take old items for recycling. For smaller items like power tools and computer printers, it is much better if the retailers take back the equipment themselves. This reduces the likelihood that purchasers will simply deposit the item in their residual waste bin. PC World / Currys have a policy of taking equipment back themselves. Sadly, they do not advertise this widely. I suspect this is because they do not want skips of discarded equipment in their forecourts. So, insist that they take the equipment and tell them that you bought new from them because of their returns policy. This may encourage them to publicise their returns policy more widely. With computers and mobile phones, there is the worry about data remaining on the hard disc or memory chip. This could be used to access your bank accounts. Good companies will take your old equipment and ensure that it is cleaned of data before recycling.